Did you know what Liz Truss MP announced was top of her priority list last week? Bringing back fox hunting. Yes, that's right. Instead of focusing on solutions to pressing animal welfare issues, the Tories are fixating on overturning the ban on this brutal bloodsport. Please make a donation right away to help us to gather evidence against sick fox hunters... Just £10 will help get us in the field for one day. The foxes that are chased over our countryside will experience profound trauma inflicted by multiple dog bites. If a dog has escaped underground, a terrier will be sent down the hole while the terriermen dig the fox out. The fox and terrier will experience very high levels of fear. Right now, our teams are out investigating the practice of cubbing. The huntsmen will surround a wood, slap their saddles, and hollar to prevent the fox and her cubs from leaving. They want to have their fun. The hounds are sent in and the vixen comes out to protect her cubs. But unlike her mother, the young cubs are playful and trusting. The hunters know this.... please help me end this barbaric practice by making a generous donation today – whatever you can afford will make a big difference. "Never lose sight of the fact that one really well-beaten cub killed fair and square is worth half a dozen fresh ones killed the moment they are found without hounds having to set themselves to the task. 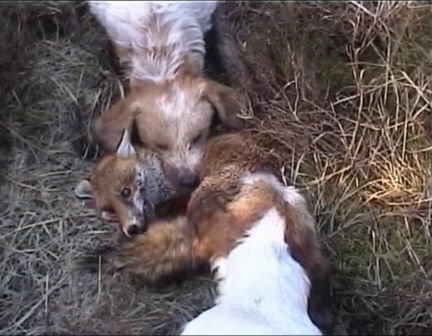 It is essential that hounds should have their blood up and learn to be savage with their fox before he is killed." – Duke of Beaufort This sick and perverted practice needs to end. I know you would not want to see it's return. I'm not going to stand by and let this happen. I need your help right now...please give £10 right away. It will make a big difference.